NEITHER GOLD DUST WEST, NOR ANY OTHER PARTY INVOLVED IN CREATING, PRODUCING, OR DELIVERING THESE SITES OR THE MATERIALS IS LIABLE FOR ANY INCIDENTAL, CONSEQUENTIAL, INDIRECT, SPECIAL, PUNITIVE, OR OTHER DAMAGES ARISING OUT OF YOUR ACCESS TO, OR USE OF, THESE SITES. WITHOUT LIMITING THE FOREGOING, EVERYTHING ON THESE SITES IS PROVIDED TO YOU “AS IS” WITHOUT WARRANTY OF ANY KIND. TO THE FULL EXTENT PERMISSIBLE PURSUANT TO APPLICABLE LAW, GOLD DUST WEST DISCLAIMS ALL WARRANTIES, EITHER EXPRESSED OR IMPLIED, INCLUDING, BUT NOT LIMITED TO, THE IMPLIED WARRANTIES OF MERCHANTABILITY OR FITNESS FOR A PARTICULAR PURPOSE, NON-INFRINGEMENT, LOST REVENUES, OR LOST PROFITS. NEITHER GOLD DUST WEST NOR ANY THIRD PARTY CONTENT OR SERVICE PROVIDER PROVIDES ANY GUARANTEE AGAINST THE POSSIBILITY OF DELETION, MISDELIVERY OR FAILURE TO STORE COMMUNICATIONS, PERSONALIZED SETTINGS, OR OTHER DATA, AND GOLD DUST WEST EXPRESSLY DISCLAIMS ALL LIABILITY FOR ERRORS OR OMISSIONS IN, THE MISUSE OR MISINTERPRETATION OF, OR THE RELIANCE ON ANY INFORMATION CONTAINED IN THE MATERIALS. YOU ASSUME THE ENTIRE RISK AS TO THE USE OF THESE SITES AND THE MATERIALS. IN NO EVENT WILL THE LIABILITY OF GOLD DUST WEST TO YOU OR ANY THIRD PARTY EXCEED THE AMOUNT OF ANY FEES YOU HAVE PAID FOR ACCESS TO THESE SITES OR THE MATERIALS, IF ANY. Some states or jurisdictions do not allow the exclusion or limitation of incidental, consequential, or special damages, or the exclusion of implied warranties or limitations on how long an implied warranty may last, so the above limitations may not apply to you. These Terms and Conditions will be construed solely in accordance within the laws of the State of Nevada, without giving effect to principles of conflicts of laws. Any actions, proceedings or suits concerning or relating to this Agreement may only be brought in a court of competent jurisdiction in Reno, Nevada, or in the U.S. District Court for the District of Nevada, and each party hereby consents to the jurisdiction and venue of such court, and waives any objections thereto. In the event any provision of these Terms and Conditions is determined to be invalid, such invalidity will not affect the validity of remaining provisions, and the parties will substitute for the invalid provision a provision which most closely approximates the intent and economic effect of the invalid provision. Failure by either party to complain of any act or failure to act of the other party or to declare the other party in default, irrespective of the duration of such default, will not constitute a waiver of rights here under. These Terms and Conditions constitute the complete agreement between you and The Lodge Casino with respect to these Sites and supersedes all prior communications and agreements. 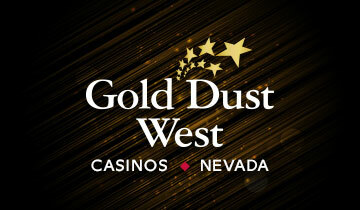 Gold Dust West may at any time, in its sole discretion, revise these Terms and Conditions by updating them on this web page. You are bound by any such revisions and should therefore periodically visit this web page to review the current Terms and Conditions.